(Nanowerk News) Tiny, perfectly smooth carbon spheres added to motor oil have been shown to reduce friction and wear typically seen in engines by as much as 25 percent, suggesting a similar enhancement in fuel economy. The researchers also have shown how to potentially mass-produce the spheres, making them hundreds of times faster than previously possible using ultrasound to speed chemical reactions in manufacturing. "People have been making these spheres for about the last 10 years, but what we discovered was that instead of taking the 24 hours of synthesis normally needed, we can make them in 5 minutes," said Vilas Pol, an associate professor of chemical engineering at Purdue University. The spheres are 100-500 nanometers in diameter, a range that generally matches the "surface roughness" of moving engine components. "So the spheres are able to help fill in these areas and reduce friction," said mechanical engineering doctoral student Abdullah A. Alazemi. Tests show friction is reduced by 10 percent to 25 percent when using motor oil containing 3 percent of the spheres by weight. 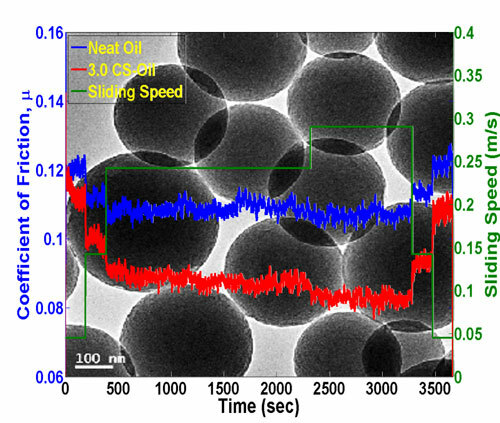 Findings were detailed in a research paper appearing online in February in the American Chemical Society journal ACS Applied Materials & Interfaces ("Ultrasmooth Submicrometer Carbon Spheres as Lubricant Additives for Friction and Wear Reduction"). The paper was authored by Alazemi; chemical engineering postdoctoral research associate Vinodkumar Etacheri; doctoral student Arthur D. Dysart; engineer Lars-Erik Stacke, from SKF Engineering & Research Centre in Göteborg, Sweden; Pol; and Farshid Sadeghi, Cummins Distinguished Professor of Mechanical Engineering. "Reducing friction by 10 to 25 percent would be a significant improvement," Sadeghi said. "Many industries are trying to reduce friction through modification of lubricants. The primary benefit to reducing friction is improved fuel economy." Friction is greatest when an engine is starting and shutting off, so improved lubrication is especially needed at those times. "Introducing microspheres helps separate the surfaces because the spheres are free to move," Alazemi said. "It also is possible that these spheres are rolling and acting as little ball bearings, but further research is needed to confirm this." Findings indicate adding the spheres did not change the viscosity of the oil. "It's very important not to increase the viscosity because you want to maintain the fluidity of the oil so that it can penetrate within engine parts," Alazemi said. The spheres are created using ultrasound to produce bubbles in a fluid containing a chemical compound called resorcinol and formaldehyde. The bubbles expand and collapse, generating heat that drives chemical reactions to produce polymer particles. These polymeric particles are then heated in a furnace to about 900 degrees Celsius, yielding the perfectly smooth spheres. "A major innovation is that professor Pol has shown how to make lots of these spheres, which is important for potential industrial applications," Sadeghi said. Etacheri said, "Electron microscopy images and Raman spectra taken before and after their use show the spheres are undamaged, suggesting they can withstand the punishing environment inside engines and other machinery." Future research will include work to determine whether the spheres are rolling like tiny ball bearings or merely sliding. A rolling mechanism best reduces friction and would portend well for potential applications. Future research also will determine whether the resorcinol-formaldehyde particles might themselves be used as a lubricant additive without heating them to produce pure carbon spheres.